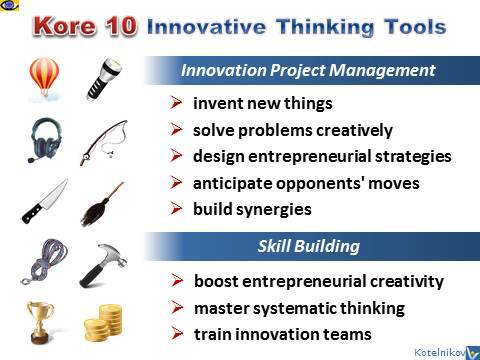 KoRe 10 Innovative Thinking Tools (10 KITT) are relevant and rich metaphors for the kind of things we work on in life and business when we need to design innovative entrepreneurial strategies, find creative solutions to a complex problem, invent new things, anticipate opponents' moves and spot trends, master systematic and systems thinking, and build synergies. It is easy to draw meaningful and inspiring comparisons between your topic of concern and the KoRe 10 metaphoric tools. This process tool is suitable for individuals or groups. Metaphoric solutions provide inspiring real-world insights. The creative impact of metaphors in creative problem solving and development of innovative strategies is enormous. Metaphors allow you to carry out your thoughts out into the unknown by using the known as a stepping stone. The metaphoric tools are fundamental parts of understanding and communication as they extend our thinking into the domain of intuition by invoking an imaginary example of something we are familiar with. 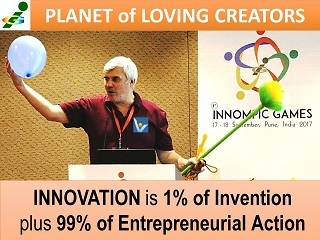 on both our own innovative projects and in collaboration with my trainees, clients and partners. 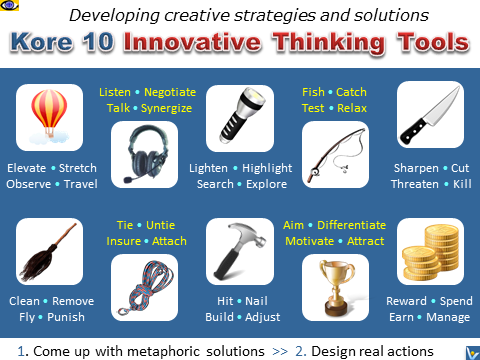 Every application of the 10 Metaphoric Tools produced truly insightful, inspiring and empowering results. Use each KoRe 10 tool to come out with one or more metaphoric solutions. Smart analogues help you take a new perspective, inspire creative thinking and describe your ideas to others. Metaphoric solutions are also to lead to insights that apply to the real world and to inspire practical ideas. The results of the smart analogy exercise are to inspire many practical ideas. Explore the list of metaphoric solutions you've generated and look for goals, strategies and actions that could be accomplished with real-world tools. Risks in test marketing: giving competitors the opportunity to quickly copy your product. Wrong rewards: many organizations reward conformism and successful political behavior over value innovation and market-changing results which makes it better to keep up appearances than to create the future.